"We highly recommend that if you take the night train to Sapa, you should spend the first day relaxing, as the journey is exhausting (unless you’re one of those people who can sleep in ANY conditions, you’re going to be knackered by the time you get there – trust us). Also, find out beforehand how intense your trek is going to be. I genuinely thought my running trainers would do, but they absolutely wrecked my feet and I don’t know when I’ll be able to wear shoes again. You will need proper hiking shoes for this." Sapa - was founded by French settlers in 1922 as "hill station" in order to escape the crowds (and heat) of the city. 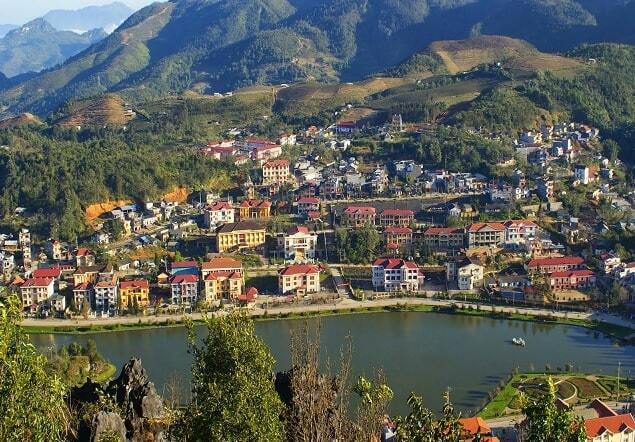 It is a small mountain town at 1500 meters altitude in northwestern Vietnam near the Chinese border. Today, Sapa is a tourist centre. Sapa is known that you can have on clear days the most wonderful views. You have views of the valley and on the peaks around you, sometimes surrounded by fog. But even when it is cloudy, the colorful people of the surrounding tribes fll the streets of Sapa. 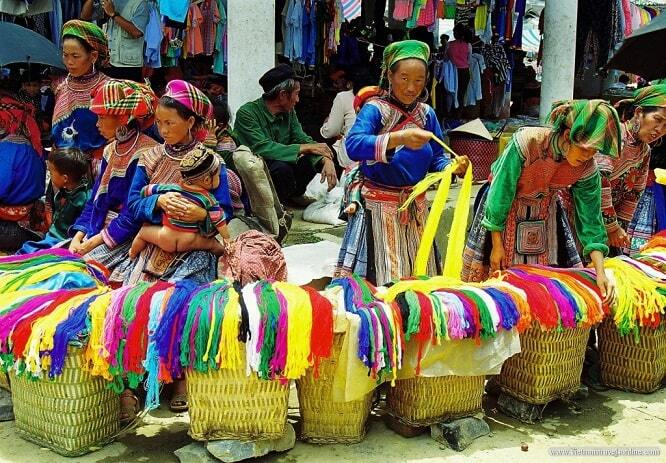 Sapa is home to many minorities of North Vietnam and South-West China. In the Sapa area are several small villages. Here live the Black Hmong, Tay, Xapho and Red Dzao hill tribes. These tribes are differentiated by their costumes. They are nicely dressed in their costumes. The population of farmers in these mountains still dress authentically. During harvest time of the corn, you see many groups of local people picking the corn or peel it. After that they dry the corn on the streets. 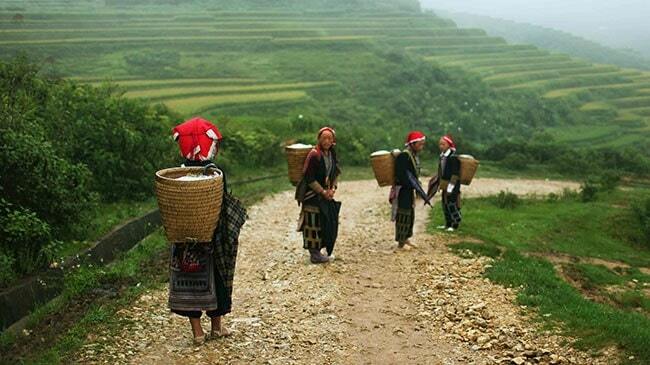 Because here you can see the hill tribes of Vietnam, this area is very suitable for trekking. Naturally, Sapa is ideally suited as a base. If you expect a colourful, picturesque mountain village, you have to adjust your expectations. Through a succession of wars (against the French, Americans and Chinese) the French colonial villas in the village fell into disrepair. And by the rapid development of tourism there has been built haphazardly. Due to the lack of building regulations there was a "construction boom" and the buildings went in the height. In the centre you will find many restaurants and shops. But Sapa is not a place to linger. This is northern Vietnam and it is a trekking place where hikers are wishing to explore the surrounding countryside of rising rice terraces. And do not forget the small settlements of tribes that seem to be a world apart. You can see the local lifestyle of these unique cultures. 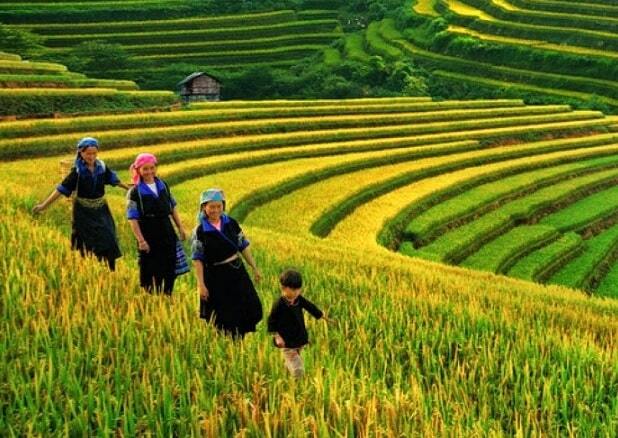 As soon as you walk around the lush of paddy fields, you will realize that this is the charm of the area around Sapa. The museum in Sapa provides an excellent overview of the history of Sapa area, including the colonial era of the French. The exhibits show the differences between the various ethnic minorities in the area. So it's definitely worth to visit the museum, when you arrive in the town and you are going to explore the surrounding area with its tribes. The small stones Catholic church in Sapa was built by the French. You can go to the Mass on Sundays and on certain nights he is only open for prayers. The road between Scapa and Lai Chau is about the Tram Ton Pass, which is on the northern side of Mount Fansipan, Located 15 km from Sapa. With its 1900 meters it is the highest mountain pass in Vietnam. The pass is on the dividing line between two weather fronts. On top you have a fantastic view. Most people stop a while at the 100 meter high Thac Bac (Silver Waterfall), 12 kilometres from Sapa. On the mountain side of Sapa, it is often cold and foggy, but the rain often falls a few hundred meters on the side in the village of Lai Chau, but it can be also very sunny and warm. It may be supprising that Sapa the coldest place in Vietnam, but there is a very hot day is in Lai Chau. Sapa is located in a valley of the Hoang Lien National Park and it's a perfect base for a multi-day hikes. In the area live several local minorities, which have their own language and customs. The locals of these small villages that you encounter along the way are often very hospitable and will not let you go before you taste their home-brewed rice wine! How do you get to Sapa? You go with the night train from Hanoi to Lao Cai on the Chinese border. From there you'll travel to Sapa. Then you take in Lao Cai a minivan, which drive you in hour to Sapa. If you want to save money, then you can also opt to take the whole ride from Hanoi into a sleeper, but this is a lot less comfortable. Sapa has a continental climate with hot summers and cold winters, and rain and fog are not strange.